Our Kindergarten classes have created some exceptional art pieces over the past few weeks. This artwork has been specifically commissioned and designed for the Ridgeview Casino Night Fundraiser, a gala event for Ridgeview parents, and will be coming up for sale on Saturday, May 23, 2015. Our paintings will be part of the Live Auction, along with artwork created by the other classes at our school. 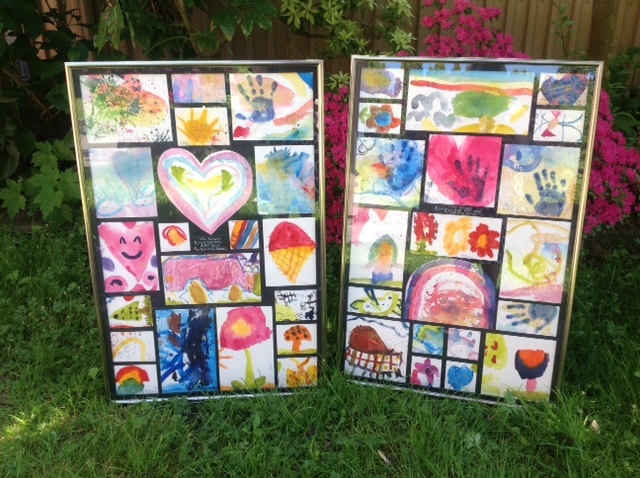 Classroom parents will have an opportunity to bid on their child’s class’ artwork at this time. We thought you might enjoy a preview of your child’s collaborative artistic creations. The term Kindergarten has a charming origin from the German educator, Friedrich Froebel (1782-1852). Kinder means “children” and garten is “garden.” Kindergarten can be literally translated to mean “children’s garden.” Froebel took the term and used it to mean “a garden of children” and it was how he referred to young children as learners. Froebel believed that each child was to be carefully nurtured, much like gardeners treat their plants. Plants need to be placed in the right spot in the garden, with attention to soil, water, food and other environmental conditions. Growing a strong and healthy plant is often a result of “the right plant in the right place,” an old gardeners’ saying. In the same way, in order to “grow” strong and healthy Kindergarten children, teachers work to create a calm, caring and supportive classroom environment for their young students. We try to ensure we are giving them the time for play, positive attention, intellectual and creative stimulation, and the love they need in order to thrive. 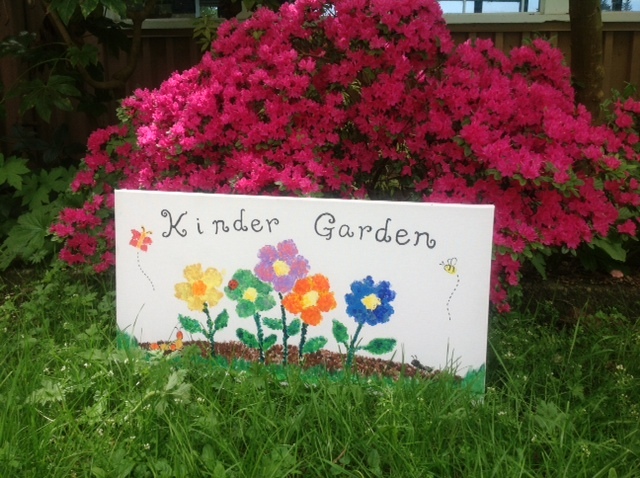 So it is fitting that with parent helpers we were able to create our own “Kinder Garden.” A classroom Mom sketched her design in pencil on a 14″ x 29″ canvas (measurements are approximate) and mixed colours for us using Artist’s Loft Acrylic Paints. Our children were given specific sections to fingerprint. We made a key with the names and fingerprints of every child so we know who painted each part of our painting. We’re delighted with our efforts, and grateful to our volunteer parents who were able to help us create this gorgeous piece of art. Our Kinder Garden is able to grow and flourish with support from our wonderful Ridgeview families. “Our hope is that this work will remind the viewers to appreciate their senses and see the joy the children have in their expressions. This Group Fine Art Watercolour Painting Collage was inspired by the class study of the five senses they use to interpret the world around them. Each child was offered artist quality watercolour materials, instruction of various techniques, colour theory and an introduction to the concepts of the theme on two different weeks. They spontaneously grasped the concepts of translating their personal experiences with taste, smell, touch, sight and hearing onto the paper….